I drove the winding road up the cliff overlooking the deepening Pacific and took in the ridiculously beautiful view. The sun was heading down in the sky as I was driving up the road toward Agnes’s house. I was more than a little curious about what kind of place I would find. Agnes struck me as simple and unpretentious, and I expected her house to be the same. I pictured a small, comfortable, one-story with a shingled roof and a neatly manicured wedge of grass out front. Maybe a little porch with a swing and a planter full of geraniums. That’s why I soon found myself checking and rechecking the address on the page and comparing it with the plaque on the tall iron gate at the end of the street. There was no denying it, the number was the same, so I drove up and pressed the intercom button. A moment later, the gate rolled aside and I eased up the driveway, lined on each side with enormous Canary Palms, the kind whose immense height and breadth and majestic quality always takes my breath away. If one of those massive fronds were ever to fall and hit you on the head, you’d be skewered to the earth like a shrimp on a spit. I pulled into the driveway, paced up the steps to an oversized stained glass and hardwood door, and rang the bell, though I didn’t need to. Before I could even take my finger off the button, the door swung open and Mary Ellen stood there, beaming. And I mean beaming—as in radiant—as in hamma, hamma, hamma. She was dressed in a classy, black, designer evening gown with a string of black pearls swooping down her neck above a plunging V.
Not… a… problem. She took me down a hallway, which was like a celebrity photo gallery. Here was a young Agnes posing with the late, original Mayor Daley of Chicago machine notoriety; Agnes and the late Chicago columnist, Mike Royko, who was the perpetual thorn in Daley’s side; Agnes with Oprah, with Clinton, with Reagan, with Jim Belushi and Dan Ackroyd, with Jesse Jackson, and,—I almost passed out when I saw this one—a group shot with Agnes and every single scrawny and fantastic member of The Rolling Stones. I dragged my chin along the floor down the hall and into the living room. The sun was settling down over the horizon and casting a red and orange glow on the surface of the sea. I knew this because I was looking at it through the panoramic window that arched around the round living room in which we now stood. The furniture was comfortable looking, very simple and classic so as not to attract attention to itself. Earth tones, greens, and muted purples created a warm, inviting environment that seemed to say, come in, sit down, stay as long as you like. Ever the waitress, apparently, Mary Ellen took the two bottles of Silver Oak Cabernet that I’d brought and excused herself saying she still had some things to do in the kitchen. I walked up to the window and looked out at the breaking waves, way down at the bottom of the cliff. “Do you like the view?” Agnes walked up behind me and put her hand on my back. I turned and gave her a hug and didn’t bother to answer the question, not verbally, anyway. She gestured for me to follow her into a large but informal dining room, also with a spectacular view, and we sat down together at the table which was, I noticed, set for four. The doorbell chimed and moments later Mary Ellen brought Cam in to join us at the table and then returned to the kitchen where we could hear her clinking dishes and clattering pans. We exchanged polite hellos and small talk until Mary Ellen emerged carrying four plates of endive and walnut salad in her experienced hands. The way she was dressed, she looked more like the lady of the house than the kitchen help, so I wasn’t entirely surprised when she sat down and joined us at the table. Cam did look a little startled, however. “With their dad?” I assumed. He gave her a slow once-over. “Now, that would be a shame,” he crooned. A wave of nausea was not a good way for me to start dinner, so I hastily raised my wine glass in a toast and we all started in on our salads. After a few mouthfuls, Cam gave an overly obvious gander at his watch and then looked impatiently in my direction as if to say, better get this moving. Not that I was all that eager to oblige him, but out of respect for Agnes’s generosity with her time and wisdom, I tried to get the conversation started. Maybe he really didn’t mean to be rude—maybe—but he sounded like he was bracing himself for a classroom lecture from a billowing old windbag professor. 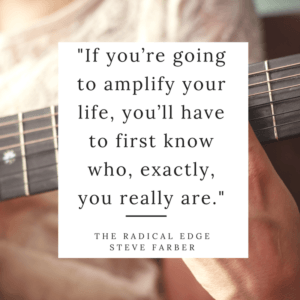 “The second element of the Radical Edge is amp your life, remember?” she said, ignoring Cam’s uneasy body language. “Have to have all three: business, life, and effect on the world, remember?” she asked again. “Yeah, I remember,” mumbled Cam. Agnes pushed herself up from the chair and walked over to a vintage looking radio perched on a shelf between the dining and living rooms. I had noticed it earlier with its oversized dials and jukebox era appearance. She clicked on the power and soft static hissed through the large grates of the radio’s speaker. She cranked the volume up. “How about now?” she called. She cranked again as if she were channeling the spirit of Mick Jagger from that picture on the wall. “Now?” she was shouting over the noise. The three of us at the table all clamped our hands over our ears and looked incredulously at each other. Leaving the tuning dial right where it was, Agnes merci- fully turned the volume back down to barely audible fuzz and stood by the radio smiling as if she’d just shared with us a glorious composition. “That was noise,” Cam groused. Leaving the volume where it was, she now fiddled slightly with the tuning knob until the static evaporated and Take Five by Dave Brubeck jumped from a clear, crisp station. “Oh… a little jazz,” Agnes delighted. “Louder, please,” she said to herself and swung up the volume once again. This time, I noticed, none of us did any ear clasping whatsoever. “Too loud?” she asked again. She nodded, turned the level down to where it filled up the background but didn’t encroach on our voices, and came back to her chair. Silently, she placed her napkin back on her lap and reclined lazily, staring at Cam and then me. She waited, saying nothing. Neither did I, or Mary Ellen, or Cam. Brubeck continued to swing in and out of the sound of the surf from the ocean below. “Get the point?” asked Agnes. “I know what they showed me when I started working, a poster on the wall with a bunch of statements about ILGI’s values. That’s all I know about it. I don’t think it’s any big deal one way or another.” Again, he looked at his watch. Cam popped the clasp on his Tag Heuer and dangled the watch over the table. Agnes took it in her cupped hands and admired the workmanship. “Very, very nice,” she cooed and handed it to Mary Ellen, who abruptly jumped to her feet and jetted into the kitchen, taking Cam’s bling hostage. “Hey! What are you doing?” he cried as if she’d ripped off his pinky.